A brand new innovative product. Horsecrocz are for use over hoof dressings such as when a poultice is applied to protect them from scraping and general wear and tear. 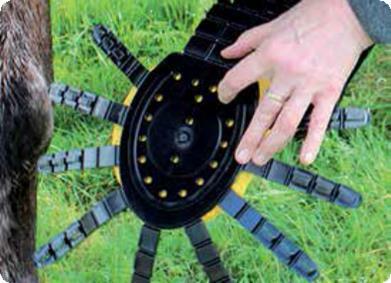 Horsecrocz can be reused many times making it a cost effective solution to protecting any hoof dressings. 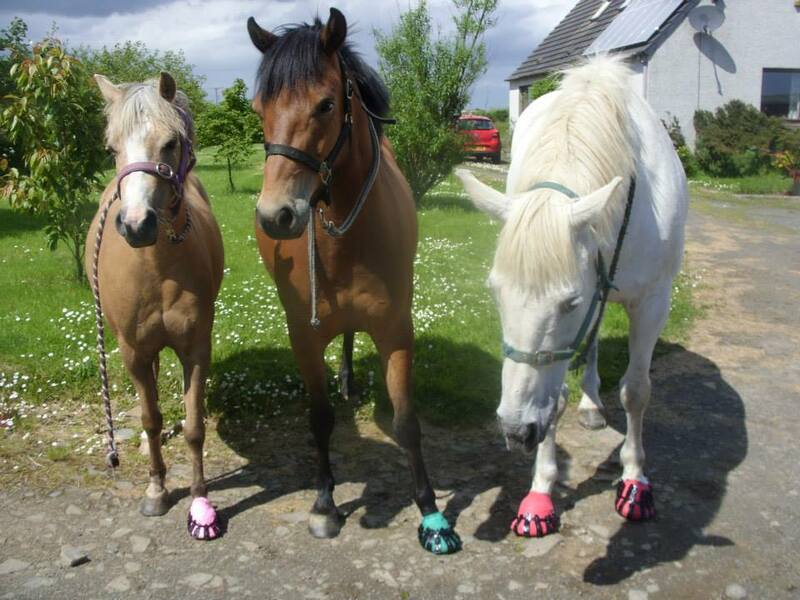 If your horse has lost a shoe, a Horsecrocz will keep the hoof protected until the farrier comes; especially useful if the horse is tender footed.A useful addition to any equine first aid kit, the flexibility of design allows three sizes to fit the majority of equines and are quick and easy to put on and remove. Each pack come with x5 HorseCrocz Ties and additional ties can be purchased separately for future use so. An essential tool for every horse owners first aid kit. HorseCrocz can be reused many times making it a cost effective and relatively inexpensive offering. There is an additional benefit in the design of small holes in the sole which allows for liquid to be injected in to make a conforming hoof/sole support, which may be useful for vets or farriers. The open design around the hoof wall increases flexibility and breath-ability avoiding build-up of moisture that commonly gets trapped with other protective coverings. A positive feature of HorseCrocz is that they are robust enough to allow the horse to be turned out. 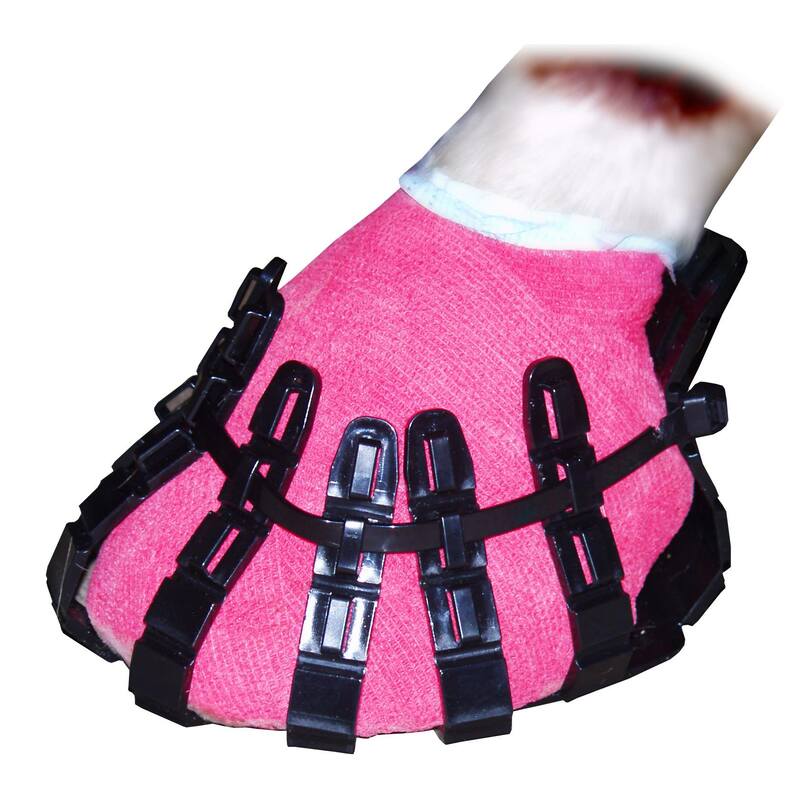 Measure hoof with the dressing on, across the widest part, the fitted Horsecrocz should have the tie fitted approximately 2/3rds of the way up the hoof. Do not pull tie tight, allow enough diameter to allow placing over the hoof with dressing in place. Place hoof into the Horsecrocz, fitting it so that the heel portion is resting against the bulbs of the heel. If the tie is not already threaded through the fastener of the tie, do so now. Pull the tie so the Horsecrocz is fitted securely. Ensure that the Horsecrocz does not rest or place pressure on the coronary band. To remove the Horsecrocz, carefully cut the tie and remove. To help you choose what size of HorseCrocz will be appropriate, we have produced a sizing guide for you, this is only meant as a guide as size of hoof with also depend on breed/type of horse. Hoof measurement taken side to side across the broadest part of the sole and add on ½ inch for the dressing . I have used this product and it is the best of its Kind. It holds poultices in place, keeps feet good awaiting the farrier after a lost shoe, and even stays on when turned out. I have used mine about 8 times and it is still going strong. Worth every penny. Easy to put on, and they stay on! As a non-horsey person, these were golden when my wife left me to poultice the kids pony while she went off on holiday. It was easy to put on and I didn’t have to worry about it staying on, just tied it on tight, no problems. This happened before (she was at work that time) and I got in a mess with plastic bags and duct tape and then I’d bring in a pony with no poultice from the field at the end of the day. No more! The pony can’t seem to get the Horsecrocz off, and I’m sure she tries. Thank you Horsecrocz. That is what they should be called as I am left wondering how I ever managed without them! They are so easy to use and I have found them brilliant in keeping everything in place for any foot treatment. My flat footed sporthorse is eternally grateful, as he can still be turned out while I am waiting for the farrier ( who was very impressed too) to come and re fit his thrown shoes! Excellent service, received my order the next day. Much easier to use than what I was previously using for protecting any hoof dressings and it stayed on in the field too which was great as my horse hates being in. I bought this as a first aid item, my mare got 2 abscesses last winter and this was just the thing I needed. I haven’t actually had to use it for that yet, but I used it when she lost a shoe recently. She is very footery on hard ground/gravel without shoes and I had take her up the road to the stable. I thought I would try it out and I popped my Horsecroc on her, she was completely sound on the road, and the gravelled yard! I don’t think she could quite believe it herself. Fingers crossed I have no abscesses this year, but I am delighted with the product. Thank you! Just bought one of these last week for my WB x. Was fed up wrapping up his hoof in Duct Tape to protect his poultice. Worked a treat, was a bit tricky to put on the first time but after that it has been so easy, turned him out into the field with it and it stayed on no problem. Horse is now poultice free and have put the Horsecrocz in the first aid box for the next time (which I hope won’t be for a while). Will get some extra ties for the next use but there is hardly any wear on it apart from some scuff marks.